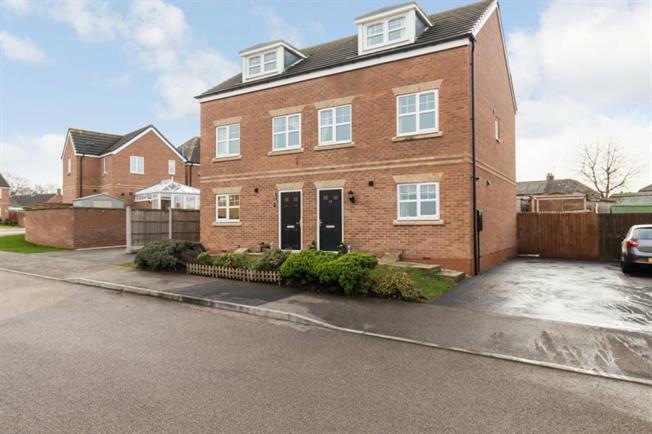 3 Bedroom Semi Detached House For Sale in Chesterfield for Guide Price £180,000. Occupying a quiet cul-de-sac position in the ever popular area of Hollingwood is this beautifully presented three bedroom semi detached property with off street parking and well maintained rear garden. floor is the well presented living room with views over the garden. Stairs lead to the first floor landing and two nice size bedrooms and family bathroom with w.c, wash hand basin and bath. To the third floor is the main bedroom and en-suite with w.c, wash hand basin and shower. To the side of the property there is ample off street parking and to the rear the garden has a decked seating area and lawn area.